Below is the full schedule for the meetings, which all run from 6 p.m. to 7:30 p.m.
As we build out safe infrastructure, we need to make sure we’re obeying the rules of the road. Refresh your memory by reviewing the guide on the back of the City’s Bike Network Map. 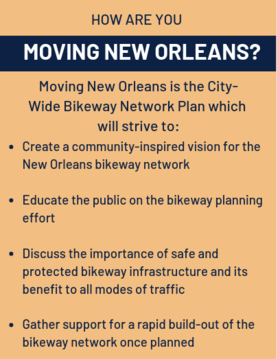 For more information about Moving New Orleans Bikes, visit the website and stay up to date by signing up for the newsletter.